U.S. Geological Survey map, shows the epicentre of the earthquake near Lamjung, Nepal. In our earlier post, we showed you some tweets by various people, like Pastors, Missions and Evangelical Preachers, which tried to suggest Nepal should follow the path of Jesus in order to avoid such calamities, or to take respite from the misery the tragedy has brought to them. While some of these tweeters were actively involved in evangelism in their real life, there was no proof to say their appeal went beyond social media, right upto Nepal. This prompted some defenders of evangelism to dismiss them as “loons from Mid-West America” who formed part of a “fringe” with “hardly any significant following”. While we responded to these juvenile arguments here, we decided to follow up on the alleged proselytisation in Nepal. While there isn’t any reasonable data to conclude that conversions are actually on, there is cause for concern and the situation needs to be monitored. We say this because solely based on their internet activity, it is easy to establish that Christian evangelical groups have reached Nepal, and although they aren’t converting people yet, they are actively providing aid and relief. Samaritan’s Purse, is one such organisation. In it’s Mission Statement it clearly says it is an “evangelical Christian organization providing spiritual and physical aid to hurting people around the world” … “with the purpose of sharing God’s love through His Son, Jesus Christ.”. As per reports on its own site and updates on its Twitter Account, they already have people in Nepal providing relief material, in as many as four districts. As of now, they are only providing help and aid to Nepalis. But along with their stated Mission, their past records show they are active in proselytisation. In 2012, a UK based organization revealed that Samaritan’s Purse was engaged in a covert operation of influencing children in poor countries, to convert to Christianity by enticing them with gifts and toys under a “Shoebox Gifts” program officially called “Operation Christmas Child”. 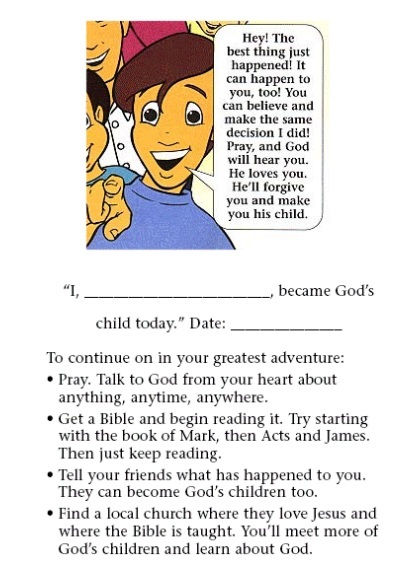 Along with the gifts, they give a pamphlet which is “a direct attempt at religious conversion of young children, complete with a “sinner’s prayer” of conversion and a pledge card.” Soon, the local church invites these children to “share the Gospel” under a course called “The Greatest Journey”. See the booklet distributed here. It also must be noted that at that point in time, Samaritan’s Purse had received more than $200000 from the US Government, thus making the Government a party to conversions. In 2005 again, Samaritan’s Purse was once again under scrutiny for using aid as a tool to convert Muslims in Indonesia, which was ravaged in the Tsunami. Once again, they had received donations form the US Government, which went upto $300000 that year. In 2010, Haiti was struck by an Earthquake, and there again Samaritan’s Purse was quick to reach. Once again, providing medical help and proselytisation crossed paths, with one the medical volunteers and also Director of the organization said “We came to Haiti not just to extend people’s physical lives, but to point the way to eternal life through faith in Jesus Christ” as per their own annual report. If Doctors themselves declare that they have come to convert people, what else is left to say? This trend of rushing to help people in disaster zones is a regular feature with Samaritan’s Purse, be it the earthquake in Costa Rica, hurricane in Nicaragua, tsunami in Samoa, cyclone in Vanuatu or typhoons in Philippines. When I received my shoebox, I was very happy. I learned that Jesus loves me and that he sent me the box. After I got the box I started coming to the church and my parents started coming with me. Samaritan’s Purse knows how to go about their work. They target people when they are most vulnerable: either in the midst of a natural disaster, or when they are children from economically backward families. It probably is the easiest to get such people in the fold. And that is why, this organization has reached Nepal. As usual, the plan will be to start with providing physical aid, and then slowly moving on to spiritual aid. While there will be no direct proof of conversions for some time, at least until the dust settles, slowly the real agenda will surface. Nepal is no stranger to Samaritan’s Purse. When there was a drought in the area where Nepal’s Chepang tribe resides, Samaritan’s Purse was working with a Christian partner in Nepal to provide emergency food to the tribe. Given all of the above, and the fact that Nepal legally allowed conversions only in 2008, Nepalis need to be alert and should see to it that if they were to choose to change their religion, it should not be under any sort of force from or moral obligation to these evangelical relief groups.